In previous blogs, we’ve talked about the importance of having the right tools for the job in order to make your cooking experiences both easier and safer. However, we don’t mean you need to go buy out the entirety of your local kitchen supply store—that would be overkill! 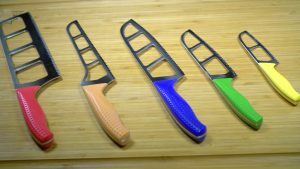 If you’re looking to make your cooking adventures easier and minimize the risk of injury while you cook, you don’t necessarily need to have every single gadget on offer; you just need a few great quality kitchen knives. What does that mean, though? No, we aren’t talking about seasoning. The tang refers to the part of the blade that extends into the knife handle. In some knives, the blade will only extend an inch or two into the handle—this is a partial tang knife. A quality knife will be “full tang,” or one in which the blade extends all the way back in the handle. This offers you better stability, control, and durability so you can trust your knife will work well and last longer. In many knives, they will have the handle attach to the tang, so you can see how far back it extends. If you’re unsure, ask the manufacturer or check the specifications; a full tang knife will say it has a full tang. In a set of quality kitchen knives, you’ll see a variety of different lengths. This is because, generally speaking, it’s good kitchen safety to match the knife to the ingredient you’re working with. It’s overkill to use a 10 inch knife to chop up some mint, but conversely, it’s going to be a lot more difficult to carve up a squash with a small 4 inch knife. That being said, if you’re going to splurge on a single knife, go big or go home—in a manner of speaking. For a quality knife set, look for one with a variety of lengths and blade styles (both serrated and solid). However, if you’re only going to buy one, a longer knife will be more versatile than a short one, so shoot for a knife in the 8 to 10 inch range. There are a wide variety of different shapes in knives, and generally, the shape is designed to a certain purpose. The two most common shapes when it comes to general-purpose knives, especially those 8 to 10 inch chef’s knives, is triangular in both instances; the difference is how rounded the bottom, sharp edge of the blade is. Some chef’s knives have a gently rounded bottom, and some are sharply triangular. There isn’t a great deal of difference, except in how the knife feels as you use it. A blade with a rounded bottom edge will rock as you chop, which allows you to get a smoother motion without lifting the knife very far off the cutting board. We discussed this in a bit more detail in a previous blog, but the biggest difference between a serrated-edge knife and a straight edge is the motion you’ll be using as you cut. A straight-edged knife is meant to be used with a pushing motion (think chopping), while a serrated blade is made primarily for slicing motions. Of the two options, this will largely depend on personal preference, but often, a serrated blade can be used in more instances where a straight edged blade isn’t as effective. 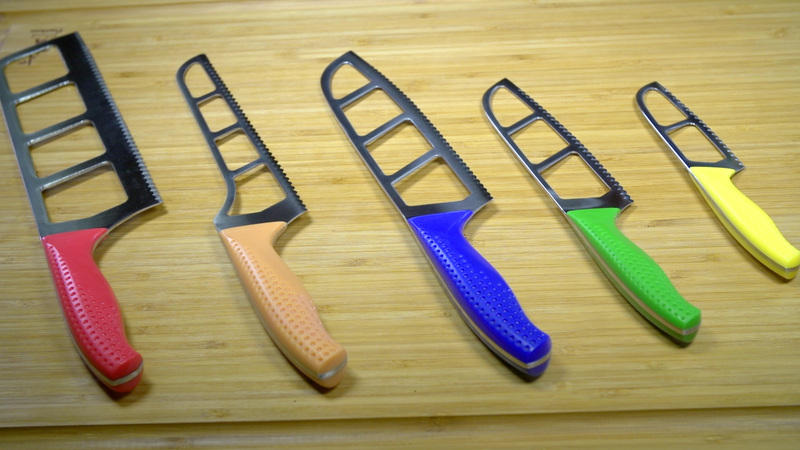 At Easy Cut, our goal was to design a durable, easy to use, versatile set of quality kitchen knives. 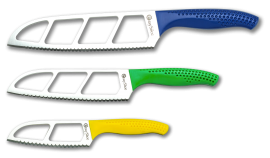 The double scallop edge is designed to stay sharp and cut straight without the need for sharpening, and the blade itself is a zero-friction blade so the knife won’t get stuck while cutting. 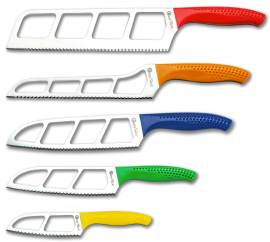 Shop our best serrated knife options online today to experience the difference for yourself!